This is the magical chair. And I call dibs! See this chair here? It has magical powers. When you sit in it, it envelopes you in happiness and comfort and makes you forget about all the troubles of your day. 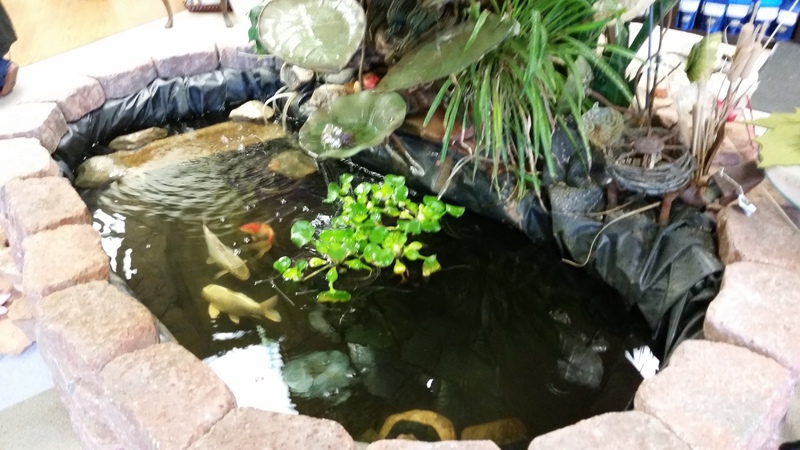 This magical chair is located in a nook of Hadley’s Tea, located at 7600 Jefferson NE, #9 in Albuquerque. Hadley’s Tea is a place to relax, enjoy some nice lunch and browse through the large selection of teas and pastries. Now before you go and think I’m cheating on St James again, let it be known that while Hadley’s Tea serves teas, they also serve coffee. They also don’t have a formal tea service. The place is more like your favorite coffee shop. And that my friends is how I justify my tea habit. My friend is a tea expert. Seriously, she can talk to you for hours about the different types of loose leaf teas and their histories. She is a mad tea genius. She and I often meet up at Hadley’s to relax and enjoy a cup of tea. Not too long ago, we met up and I enjoyed a tasty turkey and cheese croissant sandwich with a side of spicy tomato soup. The tomato soup had a nice kick to it; I believe it was spiced with green chile. Cafe style lunch fare at Hadley’s Tea. My friend enjoyed the gourmet chicken salad, which was also delicious. Hadley’s serves a variety of hot and cold teas, as well as coffee. On this occasion, I partook of a large Earl Grey tea. My decision was based partially on the fact that I enjoy Earl Grey and also because it drives my friend nuts that I drink Earl Grey as her tastes are more refined. I spent most of my lunch setting my tea next to hers and asking her if her tea was embarrassed to be seen with mine. That’s what I call lunch and a show. In addition to lunch food and pastries, Hadley’s offers tea and tea accessories for purchase. Black, green, oolong and wellness teas are all available for sale, as well as decaf selections. It’s also a great place to purchase tea accessories, including tea pots, cozies, mugs and more. Part of the tea selection at Hadley’s Tea. Hadley’s is open from 7 a.m. to 5 p.m. Monday through Friday and from 10 a.m. to 2 p.m. on Saturdays. Perhaps I will see you there. But if I do, I have dibs on the magical chair. 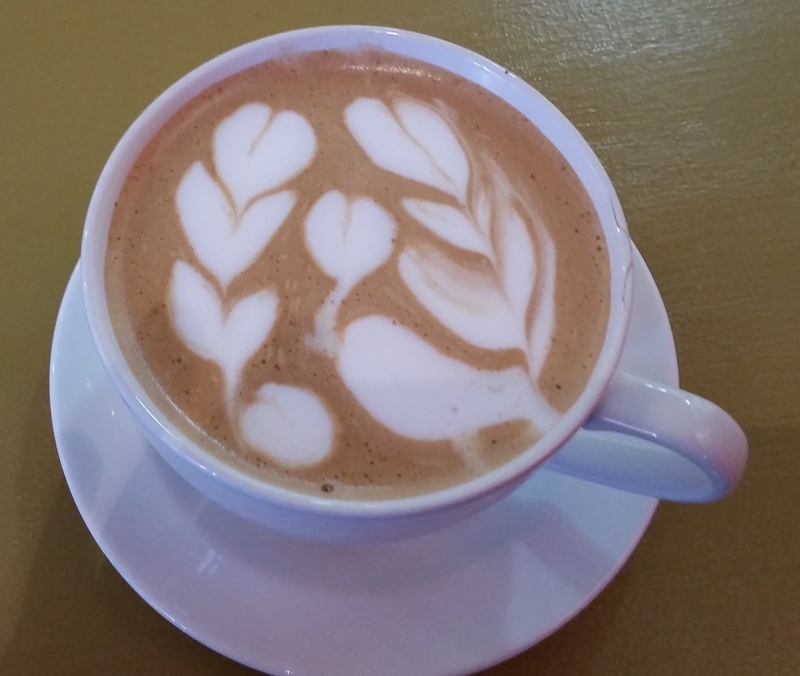 The Brew is a cool, comfortable, coffeehouse in downtown Albuquerque that serves amazing locally roasted single source coffee and tea with an artistic flair by some very friendly staff. Located at 311 Gold Ave. SW, the tiny shop features Villa Myriam coffee. This Arabica bean coffee is grown in the hills of Piendamo, Columbia and then hand-roasted in Albuquerque. 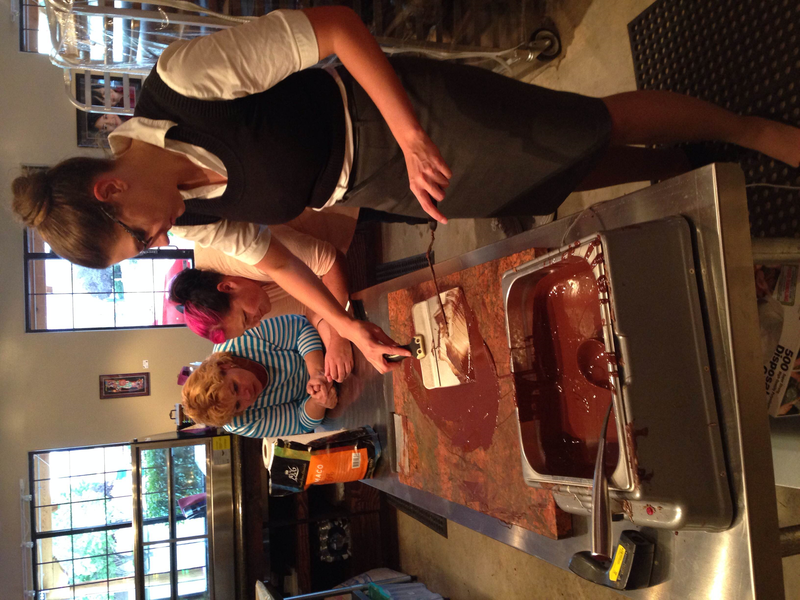 It is sold and served at numerous locations in Albuquerque, including Whole Foods and The Range. Even better, the Brew partners with Joliesse Chocolates (check out our review here) to serve handmade local syrups, including a red chile syrup. 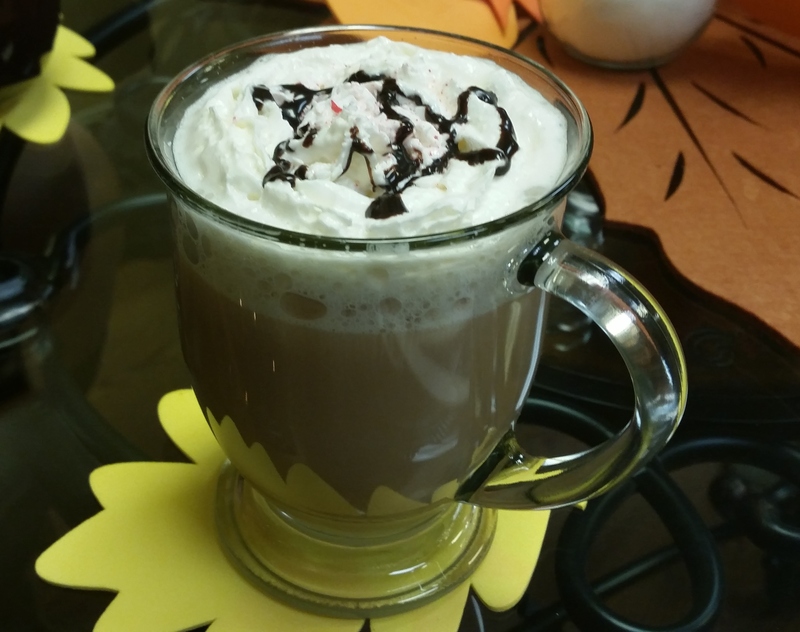 The menu offers espresso, brewed coffee (drip, café au lait and red eye) and specialty drinks, including a Red Chile Mocha and a Crazy Monkey, which is banana, caramel and mocha. In addition to coffee, the Brew also offers an assortment of hot and cold brewed teas and tea lattes. Two particularly tasty concoctions are the Roobios latte, made of South African Roobios and pure cane sugar, and the Dirty Chai latte, made with chai and espresso. The friendly staff serves the lattes with such beauty that it’s almost hard to drink the lattes, but you push through it. 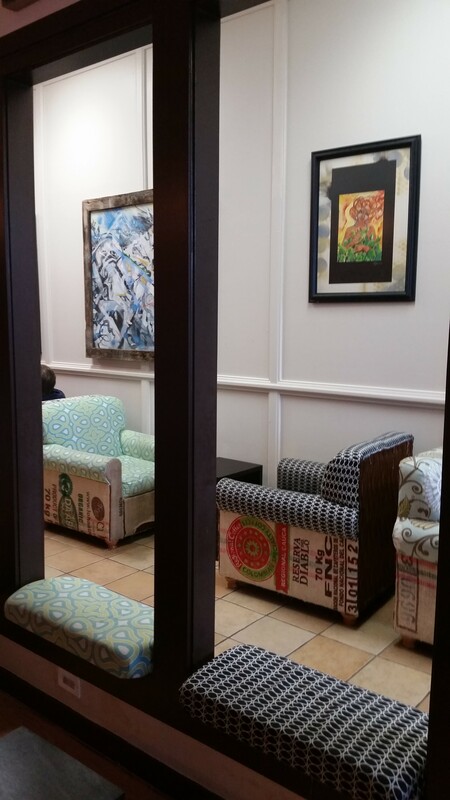 The coffeehouse itself includes bright colored walls, funky art pieces and comfortable seating. Guests can use free Wi-Fi while working at a number of tables, or can relax and spend talking with friends and family in one of the comfortable, bright armchairs or couches. The Brew is open from 7 a.m. to 6 p.m. weekdays and from 9 a.m. to 4 p.m. on Saturdays. 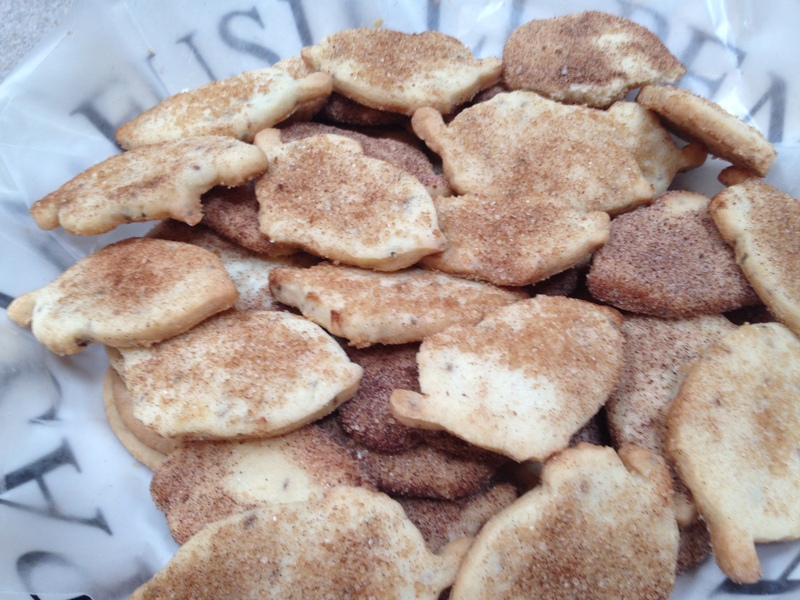 Bizcochitos, Biscochos, whatever you call them and however you spell them, they are a New Mexico staple around Christmas time. 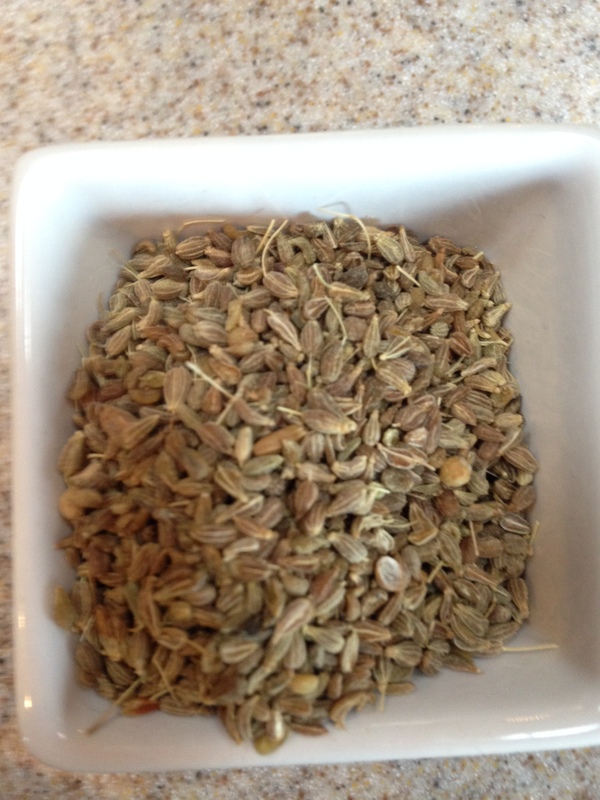 Here’s my current recipe. It makes 4-5 dozen, depending how big you cut em and how good you are at rerolling the scraps etc. 1/2 cup liquid, dealer’s choice: whiskey, brandy, sweet wine, orange juice, apple juice. For my batch, I used 1/4 cup whiskey and 1/4 cup orange juice. Cream lard with sugar and anise seed on medium. In a medium bowl, beat eggs until light and fluffy. Add eggs to creamed sugar/lard mixture and mix until combined. Slowly add flour about 1/2 cup at a time and mix until a stiff dough has formed. You might not need all of the flour. Remove dough, wrap, and refrigerate overnight (or a few hours). Let dough stand 15-20 minutes or until soft enough to roll. Roll out dough to approx. 1/8 inch (they will be thick). Cut with cookie cutter and place on cookie sheet. Bake 10-12 minutes or until bottom turns a golden brown. Mix cinnamon and sugar in a bowl. As cookies come out of the oven (and after cooling about 5 minutes), drop top-down in cinnamon/sugar mixture then set aside to cool further. I like to think I’m a laid back, authentic person. For the most part, I’m not judgmental (unless you’re a Kardashian, and then bring it) and I don’t particularly care about status. But there is one thing that I’m a snob about. And that is my chile. And by chile, I mean chile, not chili. I know this is a New Mexico thing, and if you look at dictionaries or websites, they say that you can use chile and chili interchangeably. But not in New Mexico, I say (rather snobbishly). You can always tell a native by whether or not they know the difference between the two. Green or red chile is stuff from heaven (made from our state-grown chile peppers, either red or green depending on when you pick em). Chili is that brown Hormel-like substance served in other states. So imagine how trepidatious I felt when I found myself at the Owl Café in Albuquerque looking at their menu and seeing the Owl Burger “with green chili.” As a child, I had been to the Owl Café in San Antonio, NM many times to enjoy the Owl Burger. In fact, I believe it serves one of the best green chile (I just can’t call it chili) cheeseburgers in the state. The original Owl Café was established in the 1930s in San Antonio, NM, and in 1986, the Albuquerque location was opened. 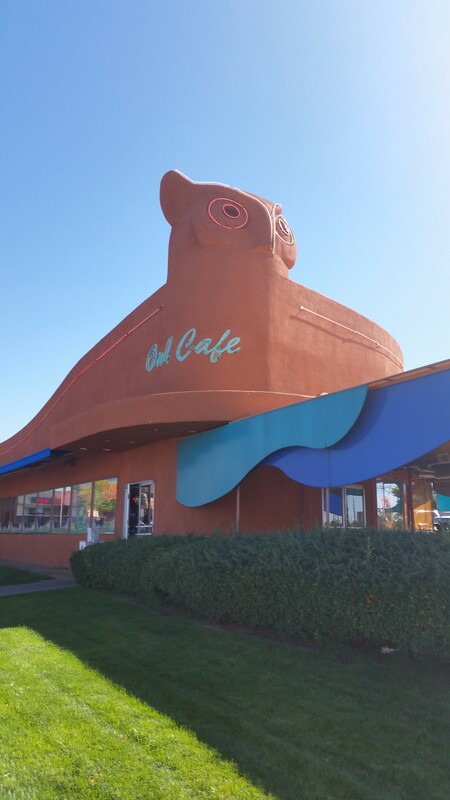 The Albuquerque Owl Café has a 1950s diner theme in honor of nearby Route 66. There’s a jukebox in the restaurant, a pie case filled with desserts, and plenty of barstools and tables to enjoy a step back in time. The Owl Café, Eubank Blvd Albuquerque. It’s an OWL, people! So had I been wrong about the burger? Had somehow the expansion to Albuquerque changed what the burger had become? Had the Owl Café forgotten its roots and started to make burgers that weren’t as good? Or worse, were smothered in some weird green Hormel-like chili with an I? During lunch with some friends, I decided to momentarily put my snobbishness aside and order the green chile (won’t do it) cheeseburger. The cheeseburger runs about $5, and you can order regular fries, sweet potato fries or onion rings for an additional $2. 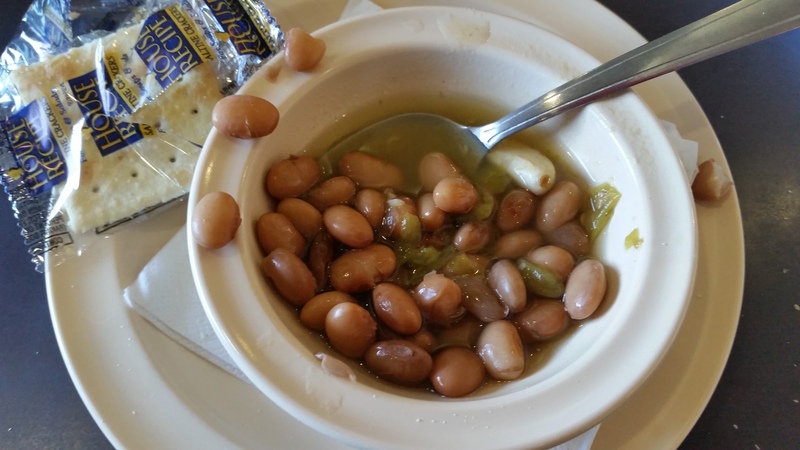 Instead of the staple chips and salsa as an appetizer, the Owl Café offers small bowls of beans and green chile. The green chile had a bite to it, and the beans were nicely flavored, so I began to become hopeful about the Owl burger. Beans & Green Chile is the new Chips & Salsa at the Owl Café. If you know what that means, you might be from New Mexico. And then the burger came out. The patty was hand-made and large. It was topped with lettuce, tomatoes, cheese and lots of green chile. A nice sized portion of sweet potatoes covered the rest of the plate. This looked promising. Then I took a bite. The burger was juicy, the condiments fresh, and the green chile was hot. Owl Café Green Chile Cheeseburger and Sweet Potato Fries. It was delicious and just as good as I remembered from my childhood. I wolfed the burger down in no time flat. Then I was overcome by a wave of shame. Here I was judging the Owl Café for their use of an I instead of an E, and they delivered a wonderful burger. 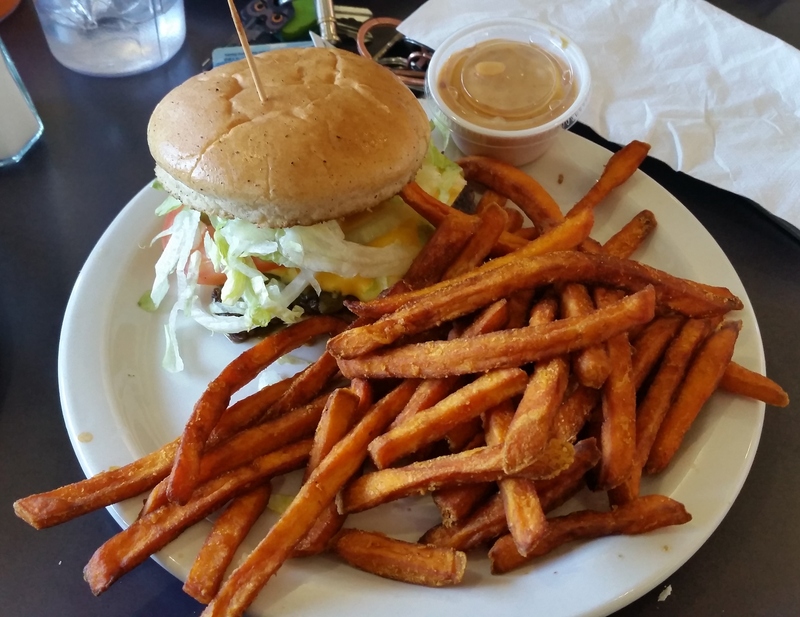 Luckily, the sweet potato fries helped me push through that shame. What’s the lesson in all of this? I don’t know, really. I mean, I still don’t like people to use the word chili when talking about green or red or when they’re offering to throw it on my cheeseburger. But the Owl Café still serves a fantastic, mouthwatering, Owl Burger with green chile. So I guess the lesson is…well, just go try the cheeseburger. The Albuquerque location of the Owl Café is at 800 Eubank Blvd. You can’t miss it. The building is shaped like an owl. 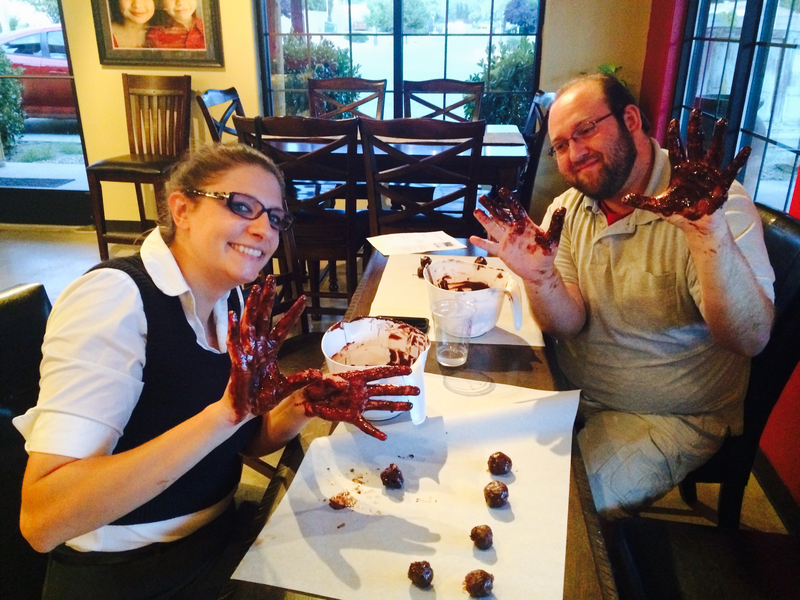 Their hours are 7 a.m. – 10 p.m. Monday – Friday, and 7 a.m. – 11 p.m. on the weekends. Rebel Donut, according to their website, is Albuquerque’s “premier artisan donut and pastry shop.” Being a recent arrival to the Albuquerque area, I had heard a lot of office chatter around the water cooler about how great this little donut shop was, and how we “had to try it!” So not long ago, with the Albuquerque Balloon Festival in full swing, Team EatingNewMexico took an early morning foray to the Abq East Side to grab some artisan donuts and coffee, and to see if we could spot any hot-air balloons floating over town. We arrived at Rebel Donut around 7:30 AM on Sunday morning. Their normal business hours are 7:00 AM-4:00 PM on weekends, and according to their Facebook page, they had opened an hour early to accommodate early-risers attending the Balloon Festival. When we arrived, the shop was not busy and we were able to go straight to the counter and start the very challenging task of selecting which donuts we wanted. Actually, it was more of a challenge to decide which ones we WEREN’T going to buy! The selection was very good. 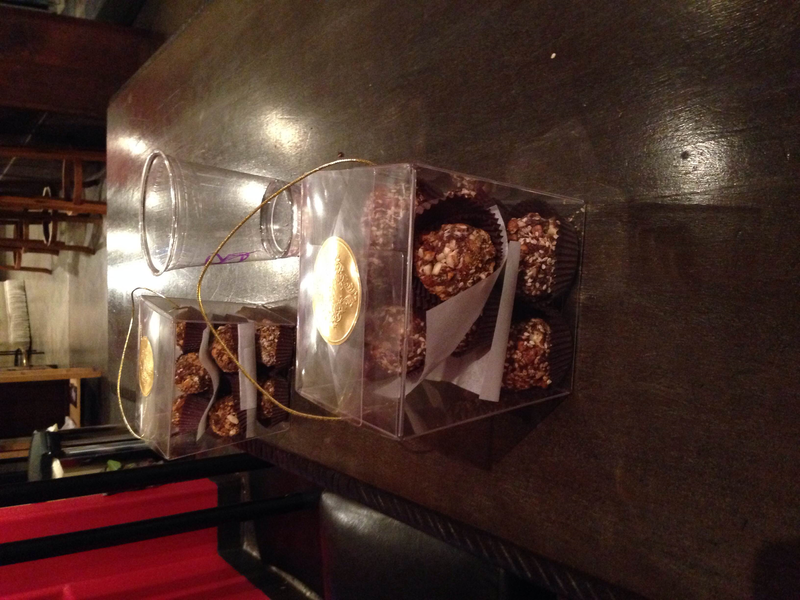 Since there were three of us, we decided on a conservative half-dozen box. 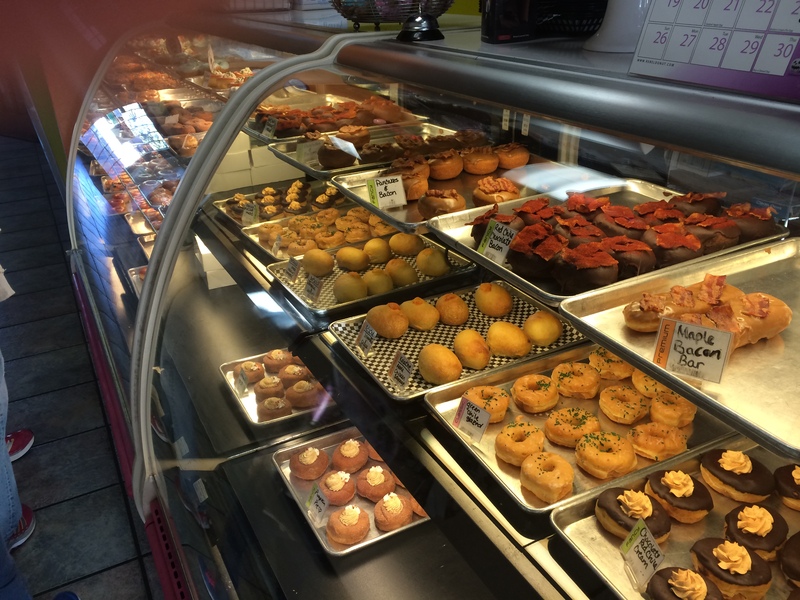 Rebel Donut varies their selection daily, so you won’t know what’s available until you walk into the store. But one of the regulars is the Blue Sky donut, a.k.a. the BREAKING BAD donut, named after the blue sugary crystalized sprinkles on top that closely resemble Walter White’s nefarious creation in the television series. 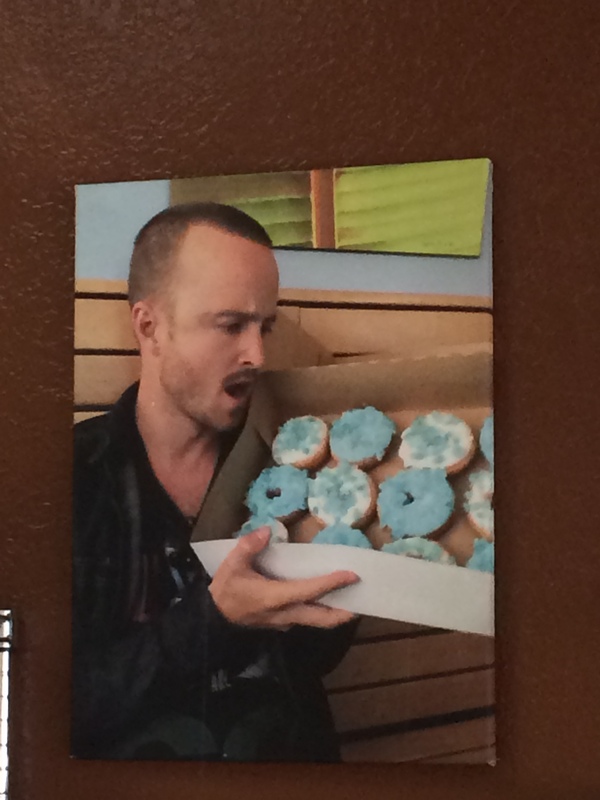 As a “BrBa” fan, the Blue Sky donut was at the top of my list — so much so, we got two. Breaking Bad’s Aaron Paul admires a box of Blue Sky. 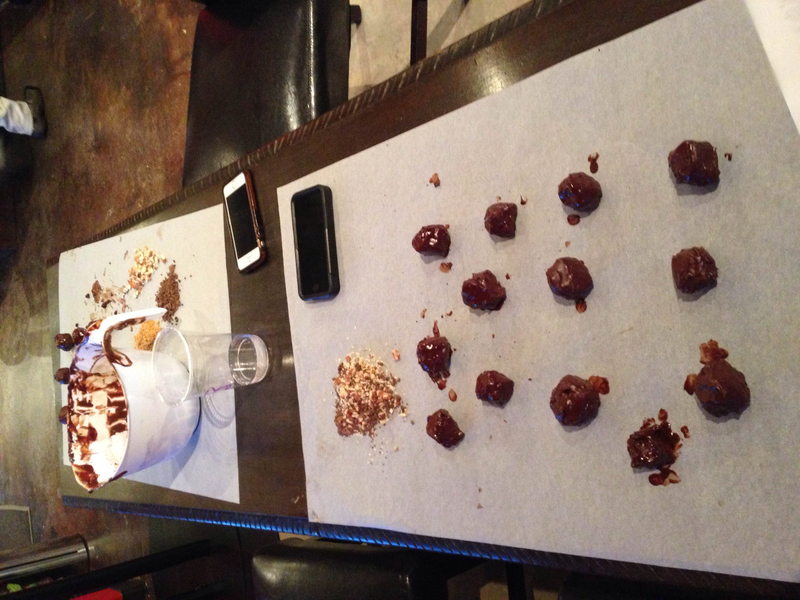 Others that made the cut were the Fruity Rebel, Biscochito, a Red Chile Chocolate Cream, and a Boston Cream. Blue Sky x 2, Fruity Rebel, Biscochito, Red Chile Chocolate Cream, and Boston Cream. The Blue Sky donut was a light cake donut with blue frosting and blue “crystal” candy on top. While it was delicious, we couldn’t quite pinpoint a flavor in it, other than sugar flavor. Maybe cotton candy? Not sure. 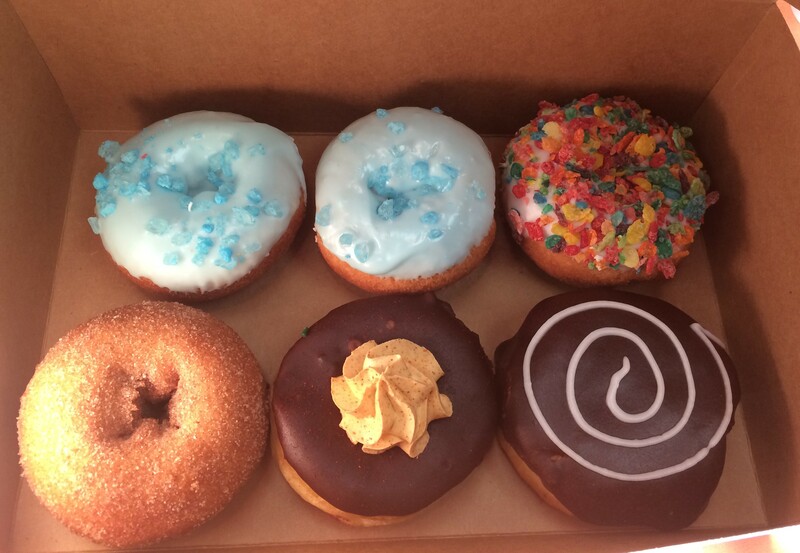 The Fruity Rebel was a basic cake donut covered with Fruity Pebbles (the 8-year-old liked it). The biscochito had the perfect biscochito flavor — cinnamon, sugar, and the subtle licorice flavor of anise. A true New Mexico tradition, in donut form (genius!). The Red Chile Chocolate Cream was a raised donut with chocolate glaze, and a dollop of red chile pastry cream in the middle. The Boston Cream was your typical BC donut. Tasty! Other donuts available that day were French Toast, Maple Bacon Bar, Green Chile Glazed, and some more savory selections, such as Jalapeno & Cheese, and Apple Chicken Sausage kolaches. So many choices. Get them all! The donuts were fresh and delicious, and while there are probably “fresh and delicious” donuts all over Albuquerque, the variety and artistry of these confections are what make Rebel Donuts special and are such a big reason for their success. Something you likely won’t find at Rebel Donut are your typical “donut shop” items, like glazed twists, apple fritters, and bear claws. (Though there was a plain glazed the day we were there.) So if traditional and cheap is what you’re after, you might want to try somewhere that doesn’t have “rebel” in the title. For coffee lovers, Rebel Donut also has an espresso menu and delicious brewed coffees, including (my favorite), New Mexico Piñon Coffee! The only negative on the day we visited was the SUN. In the early morning, the sun blasts through the shop’s huge windows, and there was literally NO shaded seating to be found inside. It was hot and bright and really uncomfortable, so we chose to eat in the car while driving around looking for balloons. At the very least, they could pull some shades or something. Overall though, we were very happy with our Rebel Donut experience, and I highly recommend a trip to Rebel Donut the next time your sweet tooth gets the better of you! Life can be crazy these days. Between work and a somewhat hectic social life, I’m bombarded by all kinds of extraneous noise. I mean how many snarky tweets, Facebook postings of cute animals and Google alerts on Channing Tatum can a girl wade through before just needing to run away for a while? Luckily, I have a special place I can go to escape the fast pace and noise of today’s world. A place that offers me some time to relax and unwind. Oh yeah, and drink some lovely teas and eat some amazing, wonderful food. 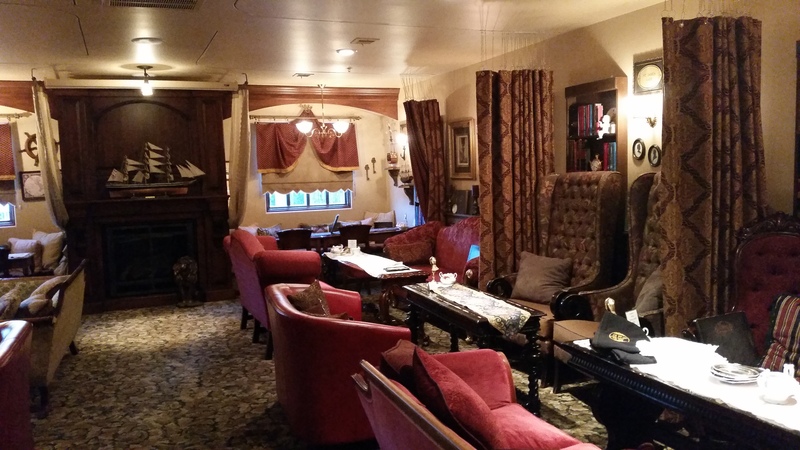 The St. James Tearoom, a quiet place for afternoon tea service in northwest Albuquerque. 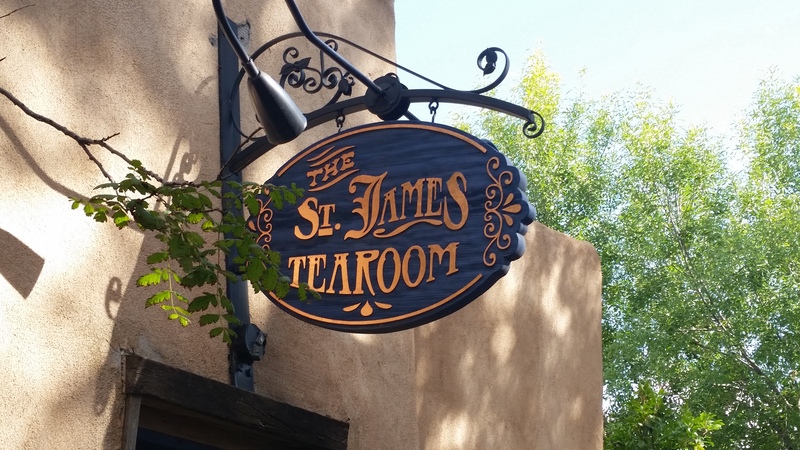 This magical place is the St. James Tearoom, located on the corner of Edith and Osuna in Albuquerque. What is a tearoom, you ask? You actually may not be asking, as you might be more refined than I am. Because the first time I heard of the St. James Tearoom, I assumed it was a place where caffeine junkies hung out, hopping themselves up on the latest teas and discussing—well, I honestly don’t know. 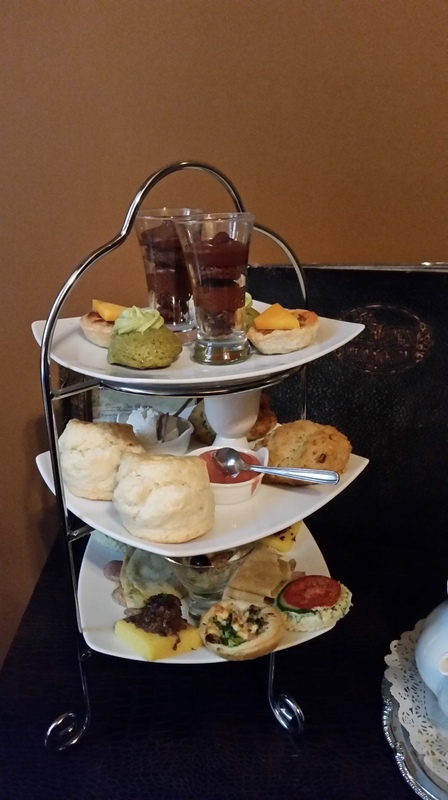 But in actuality, a tearoom is a place where you get to experience a traditional afternoon tea service, a two hour respite from the world where you relax while enjoying a variety of loose leaf teas and a full meal. The first time I ever went to the St. James Tearoom, I was leery. I’m not dainty, refined or even the least bit graceful. So the idea of sitting still for two hours in a room where I was expected to be quiet and drink tea from a dainty china cup while sitting on dainty furniture rather terrified me. I actually brought extra money with me knowing that the chances of me breaking a cup or piece of furniture was going to be quite high. While I might not be graceful, I am always prepared. I’m glad to report that in the five years that I’ve gone to the St. James Tearoom, I have never broken anything. 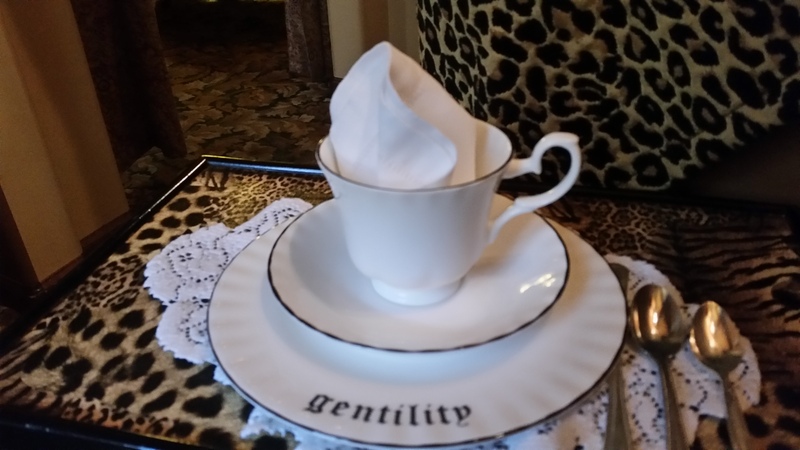 The dainty teacup, ready for service. For those of you who have never been to a tearoom and have stuck through the previous paragraph, I will reward your patience by describing the wonders and logistics of the St. James Tearoom. 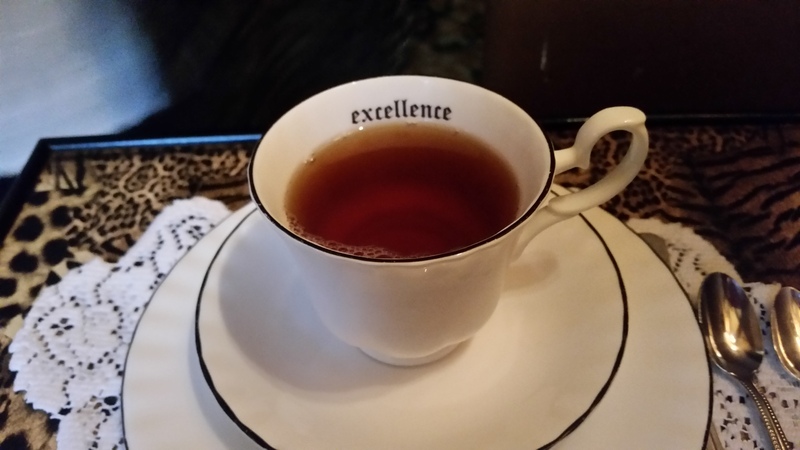 As each tea setting is broken into two-hour intervals, you must make reservations ahead of time. Reservations can be made by calling, or via their online reservation service. Seating times are available at 11:00 a.m., 1:30 p.m. and 4:00 p.m. Tuesday through Saturday, and at those times plus 6:30 p.m. Thursday, Friday and Saturday. As this is a formal tea, I recommend dressing up. Not in a full-length ball gown or anything, but at least in either your Sunday best, or minus the scruffy jeans and shorts. 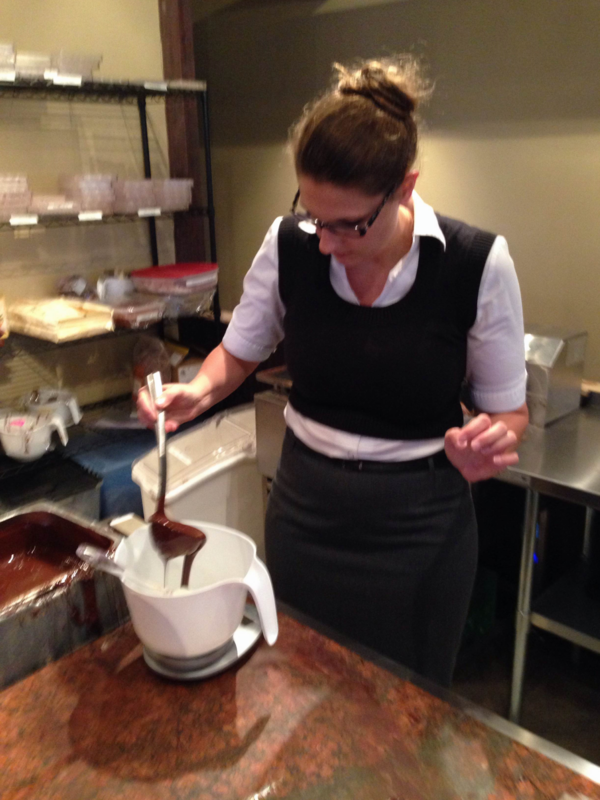 Although the staff at the St. James Tearoom is so gracious and mannered they won’t judge you. (I totally would, but they won’t). To add more fun to your adventure, you may also want to wear a decorative hat to tea (think Kentucky Derby-type hat). 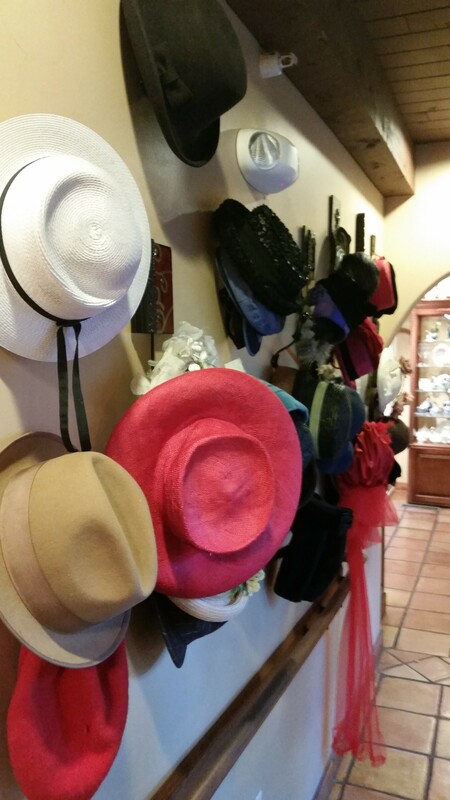 If you do not own such a hat, you can find a selection of loaner hats in the Tearoom’s gift shop. Fancy hats for the borrowing at St. James Tearoom, just for funzies. Once you arrive at St. James Tearoom, you can wander through their gift shop or peruse their wide variety of loose leaf teas and tea accessories. A bell will sound to alert you that it’s time to be seated for your tea. 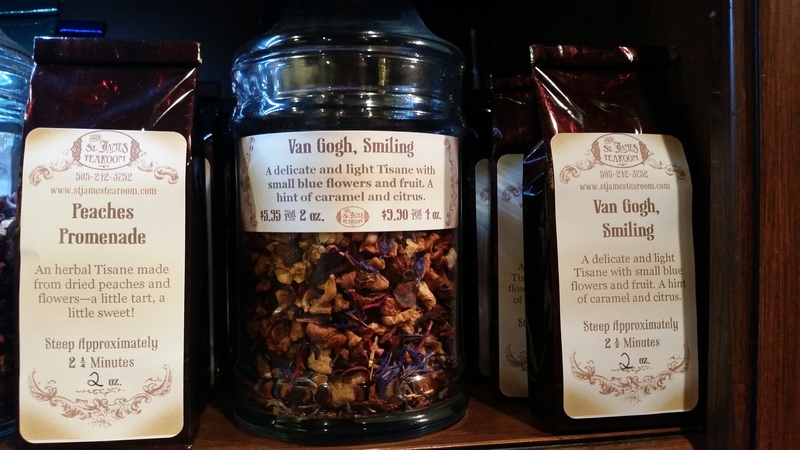 The St. James Tearoom gift shop sells a variety of loose teas with fun & unique names and flavors, such as this one: Van Gogh, Smiling. Depending on the size of your party, you will either be seated in one of the cozy nooks or the library area. Each of these areas are decorated to represent a different estate of a famous person from the Victorian era. For example, there is a room decorated to look like the home of Florence Nightingale (my favorite nook) and another to represent the farmhouse of Beatrix Potter. Each area is blocked off by a curtain to allow you privacy, and to let you enjoy some peace and quiet. So turn off your cell phone and use your inside voice. That said, my inside voice is quite loud and I’ve never been shushed, so you’ll be fine. Library seating at the St. James Tearoom. Interesting décor fits the Victorian theme. After being seated, a server (dressed in darling Victorian garb) will introduce you to the month’s menu. Each month, the St. James Tearoom features a theme. For instance, this October’s theme is “Phantom of the Opera” and next months’ theme is “A Narnian Teatime.” I only mention November’s theme because I love C.S. Lewis and am geeky-excited about the theme. Essentially, the foods will be named or inspired for the theme, such as Mr. Tummins Fig and Goat Cheese Sandwich (see how I got Narnia in there twice?). Your server will begin by serving you one of three teas for your setting. Usually, your tea adventure begins with a traditional black tea, followed by a spiced black tea, or a green tea, finished by a flowered or fruit tea. Each tea is served in a pot and you are provided cream and sugar. Your server will tell you which tea goes best with cream and sugar. Once you’re done with a particular tea, you set the lid of your tea pot up to indicate you’re ready for your next tea. A hot cup o tea at the St. James Tearoom. Excellent. All the creams and sugars you could need for your teas. 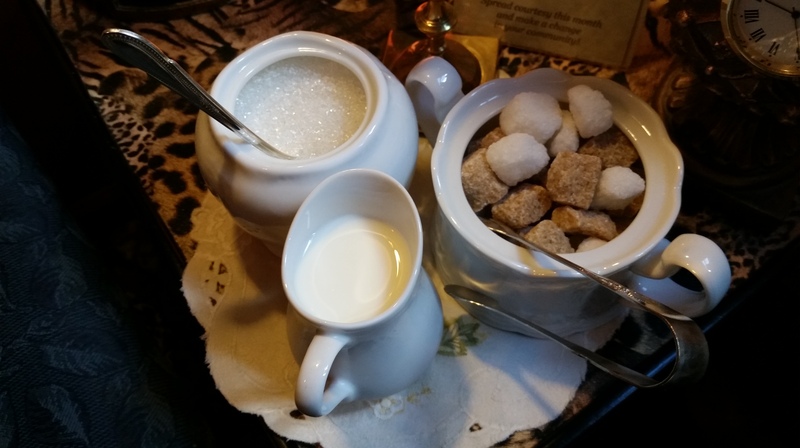 During Christmas, the St. James Tearoom features my absolute favorite tea—sparkling sugar plum. The tea actually sparkles!! The Sparkling Sugar Plum tea has little glittering bits of something that sparkle in your cup! Ah, now let’s talk about your afternoon tea food. After you’ve been given your first tea, your server will deliver heaven on a three-tiered tray. Your lunch, on a 3-tiered tray! Another bell will ring letting you know that your tea time is officially over. Feel free to cry that your respite from the real world has come to an end. Your server will offer you a hot towel to let you wipe away your tears. Okay, the towel is really to wipe your hands, but you know, they’re not going to judge you. Even I won’t judge you as there has been many a time that I’ve cried and wailed. You know, in my inside voice. I will say that this wonderful, magic experience does not come cheap. Seating prices for adults is $33 and for children 4-10 is $24. During the Christmas season, prices are $36 for adults and $26 for children. But I’ll pay anything for those sugar plum sparkles. But while the tea experience is pricey, it is completely worth it. 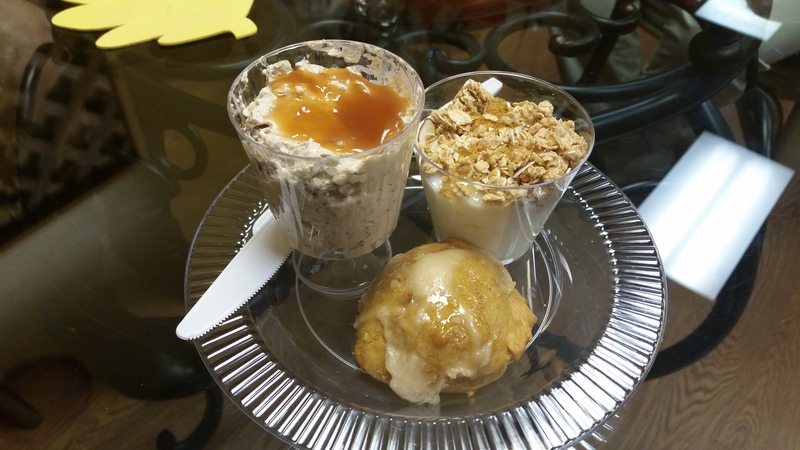 The St. James Tearoom also caters to individual dietary needs. 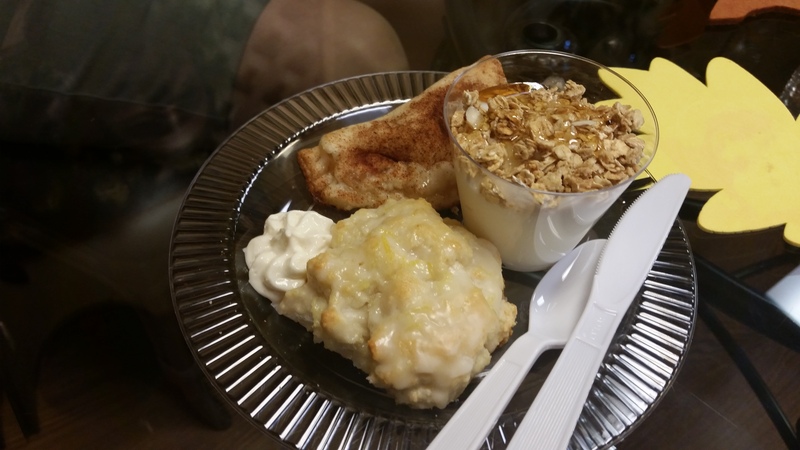 They offer decaffeinated tea, as well as a gluten free and vegetarian menu. *I realize this post sounds rather blasphemous. I in no way really mean that the food is literally like heaven, as in actuality it’s not served by Channing Tatum or Ryan Gosling. And in no way should you really sell your soul for food. Hold out for a car at least. So we went to the State Fair and for like three weeks leading up to the fair we were like CORN DOGS FUNNEL CAKES DEEP FRIED THINGS ON STICKS — MAKE IT HAPPEN, FAIR. And then we got to the fair and yes, there were many yummy smells coming from many food booths all over the place. Promising! It was about 85 degrees, I think. Which might not sound too hot, but out on the asphalt and NO SHADE of the fairgrounds, it quickly became a blistering stuffed animal & carnie infested hellscape. You know what sounds good in that environment? A/C and a nap. A cold beverage. Ice cream, snow cones. You know what doesn’t sound good in that environment? Hot, deep-fried foods. BUT WE WERE ON A MISSION. 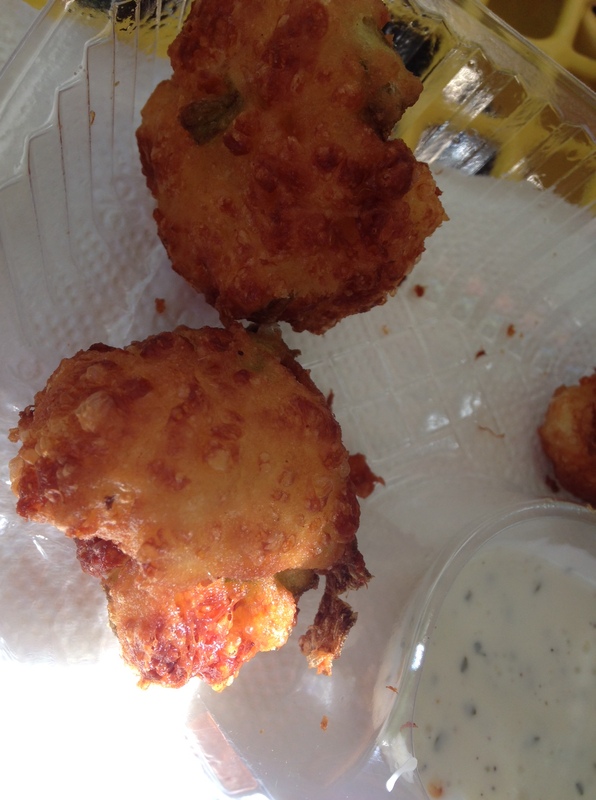 A mission to eat and love some fried fair foods (preferably on sticks). 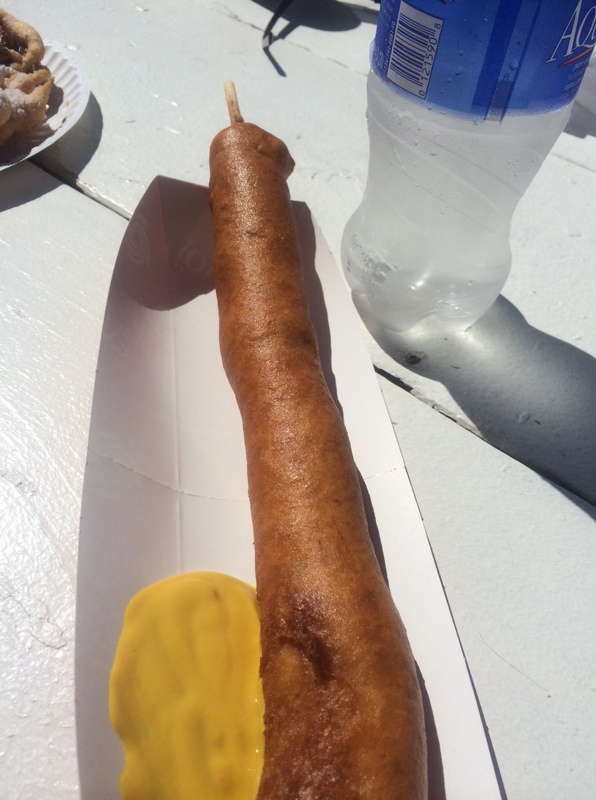 So we stood in various lines and picked up a foot-long corn dog, some drinks, and a funnel cake. Then we sat down in the shadeless noonday sun in the midst of the carnival crowds of sweating, dragging, weary people and we ate our hot, fried foods, dripping sweat into our mustard. So the corn dog was $6 and the bottle of water was $3. We also got a cold bottle of Pepsi, also $3. (Which is more expensive than the drinks at Disneyland, which I hadn’t thought possible.) The funnel cake my daughter picked out (with whipped cream and Hershey syrup) was NINE FREAKING DOLLARS. Everything was fine. Good, even. But was it exciting or special? Not really. Something else we had, which was a finalist or something in the “Unique Foods” competition, were the deep fried green chile cheese curds. Which really, sounds like the quintessential NM State Fair food, does it not? And they are served with ranch for dipping, naturally, like every other savory deep fried thing. And they were fine. Good, even. The problem I had with them was the lack of green chile. There was a slight green chile flavor, but at the NM State Fair, where we are celebrating things New Mexico, if something says “green chile” I want BAM! GREEN CHILE! Maybe my expectations were too high. I had been watching Carnival Eats for weeks leading up this day, just to prepare myself. But I found the foods to be uninspired and just OK. Oh and way too expensive. Overall, we had a fine time at the fair. We rode some rides and played some games, ate some foods, and felt somehow violated in ways we couldn’t pinpoint by a few carnies, so it was a typical fair experience. But I’m just now getting over the sticker shock of the prices for everything ($5 apiece for rides/games was the norm). My favorite part of the fair was not the food or midway at all — it was the buildings of prize-winning art, textiles, and giant vegetables. Mostly because they were interesting to look at, but also partly because they were air conditioned and didn’t cost another $15 each time we walked through a door.